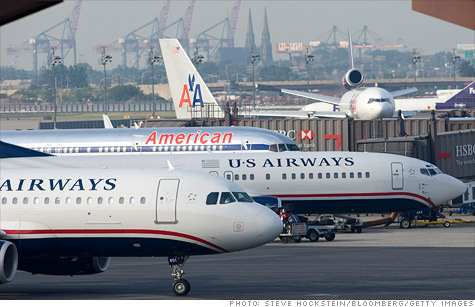 Union workers for American Airlines agreed to a potential merger, announced US Airways on Friday. NEW YORK (CNNMoney) -- Workers for three American Airlines unions have agreed to support a potential merger with US Airways Group, according to a US Air document filed with the Securities and Exchange Commission on Friday. The unions - the Allied Pilots Association, the Association of Professional Flight Attendants and the Transport Workers Union - represent 55,000 employees, US Airways said in the filing. But the airline also pointed out that a deal has not gone through yet. "Today's news does not mean we have agreed to merge with American Airlines," wrote US Airways (LCC, Fortune 500) Chief Executive Douglas Parker in a letter to his employees. "It only means we have reached agreements with these three unions on what their collective bargaining agreements would look like after a merger, and that they would like to work with us to make a merger a reality." Parker outlined the things that need to occur in order for a merger to become a reality. "To get to an actual merger, many more things must happen, including gaining the support of AMR's creditors, its management team and its Board of Directors," he wrote. "But this is obviously an important first step along that path and we are hopeful we can all work together to make this happen." US Airways stock dipped more than 2% on the news. American Airlines, which is owned by AMR, could use some help. The airline went into bankruptcy last year. In February, the carrier announced that it was cutting 13,000 jobs. On Thursday, American Airlines reported dismal results for the first quarter: a net loss of $1.7 billion. That's more than quadruple its losses of $405 million from the year-ago quarter, before the carrier filed for bankruptcy last Nov. 29. The airline blamed reorganization costs, including $1 billion stemming from the rejection of aircraft leases, and also a 17% spike in fuel prices. 0:00 /2:05Got miles? Here's how to spend them. Laura Glading, president of the Association of Professional Flight Attendants, released a statement complaining about the "excessive demands" made by American Airlines since filing for bankruptcy, which was part of the reason why the union was supporting the idea of a merger. "Not only were their demands unreasonable, but their business plan was uninspired and not viable," said Glading, in a prepared message, referring to American. "My fellow union leaders and I had no choice but to evaluate alternatives." "This agreement puts flight attendants in a far better position than any proposal American Airlines management has made," she said. She said that a merger between American Airlines and US Airways will "eliminate the competitive advantage" of Delta Air Lines (DAL, Fortune 500) and United Continental Holdings (UAL, Fortune 500). James Little, president of the Transport Workers Union, said in a letter to union members that he was supporting the potential merger on two conditions: that "US Airways' restructuring plan for labor concessions is clearly less drastic that what AMR has demanded" and that the U.S. Bankruptcy Court allows US Airways to take AMR out of bankruptcy. The last big airline merger was the formation of United Continental Holdings, a $3.2 billion all-stock deal that was finalized on Oct. 1, 2010. Other prominent U.S. competitors include Southwest Airlines (LUV, Fortune 500) and JetBlue Airways (JBLU).